This article is about modern conflicts in the Middle East. For ancient conflicts, see List of conflicts in the Near East. 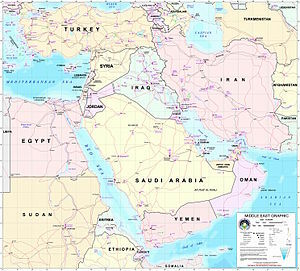 This is a list of modern conflicts in the Middle East ensuing in the geographic and political region known as the Middle East. The "Middle East" is traditionally defined as the Fertile Crescent (Mesopotamia), Levant, and Egypt and neighboring areas of Arabia, Anatolia and Iran. It currently encompasses the area from Egypt, Turkey and Cyprus in the west to Iran and the Persian Gulf in the east, and from Turkey and Iran in the north, to Yemen and Oman in the south. Conflicts are separate incidents with at least 100 casualties, and are listed by total deaths, including sub-conflicts. The term "modern" refers to the post-WWI period, in other words, since 1918. Battle of Riyadh (1902) – 37 killed. Battle of Dilam (1903) – 410 killed. Saudi–Rashidi War (1903–1907) – 2,300+ killed. Annexation of Al-Hasa and Qatif (1913) – unknown. Battle of Jarrab (1915) – unknown. Battle of Kanzaan (1915) – unknown. Kuwait–Najd War (1921) – 200 –800 killed. 1921 Ikhwan raid on Iraq – 700 killed. Conquest of Ha'il – unknown. Ikhwan raids on Transjordan 1922–1924 – 500 -1,500 killed. Revolt of Ahmet Anzavur – unknown. Kuva-i Inzibatiye revolt – unknown. Mahmud Barzanji revolts – unknown. Ahmad Barzanji revolt (1931) – unknown. 1943 Iraqi Kurdish revolt (1943) – unknown. PUK insurgency (1976–1978) – 800 killed. Iraqi Kurdish uprising (1982–1988) – 50,000–198,000 killed. 1991 Uprising in As Sulaymaniyah – 700–2,000 killed. Iraqi Kurdish Civil War (1994–1997) – 3,000 –5,000 killed. 2003 invasion of Iraq – several hundred killed (~300) on the Kurdish front, at least 24 Peshmerga killed. Anglo-Soviet invasion of Iran 100  – 1,062 killed. Bombing of Bahrain in World War II – unknown. Arab–Israeli War (1948–1949) – 14,400 casualties. Suez War (1956) – 3,203 killed. Six-Day War (1967) – 13,976 killed. War of Attrition (1967–1970) – 6,403 killed. Bus massacre – 27 killed. Hundred Days' War – 160 killed. Karantina massacre – 1,000–1,500 killed. Damour massacre – 684 killed. Battle of the Hotels – 700 killed. Black Saturday (Lebanon) – 200–600 killed. Tel al-Zaatar massacre – 1,778–3,278 killed. 1982 Lebanon War – 28,280 killed. Sabra and Shatila massacre – 762–3,500 killed. War of the Camps (1986–1987) – 3,781 killed. Mountain War – 1,600 killed. War of Liberation (1989–1990) – unknown. October 13 massacre – 500–700 killed, 260 civilians massacred. 1979 Khuzestan uprising – 112+ killed. 1979 Khorasan uprising – unknown. 1979 Azeri uprising – unknown. 1979 Baluchistan uprising – 50 killed. Iran hostage crisis – 9 killed. 1979–1980 Tehran clashes – unknown. Jewish insurgency in Palestine (1944–47) – 338 British  and around 100 Palestinian Jews killed. ^ Albert Hourani et al., The Modern Middle East: A Reader. 1993: p. 2. ^ a b c d e f g h i "CSP – Major Episodes of Political Violence, 1946–2008". Systemicpeace.org. 12 June 2013. Archived from the original on 21 January 2014. Retrieved 14 November 2013. ^ Statistics Branch, GS, War Department, 25 February 1924; cited in World War I: People, Politics, and Power, published by Britannica Educational Publishing (2010) Page 219. ^ Totten, Samuel, Paul Robert Bartrop, Steven L. Jacobs (eds.) Dictionary of Genocide. Greenwood Publishing Group, 2008, p. 19. ISBN 978-0-313-34642-2. ^ Rubin 2015, p. 508: "Despite Iran’s official neutrality, this pattern of interference continued during World War I as Ottoman-, Russian-, British-, and German-supported local forces fought across Iran, wreaking enormous havoc on the country. With farmland, crops, livestock, and infrastructure destroyed, as many as 2 million Iranians died of famine at the war’s end. Although the Russian Revolution of 1917 led to the recall of Russian troops, and thus gave hope to Iranians that the foreign yoke might be relenting, the British quickly moved to fill the vacuum in the north, and by 1918, had turned the country into an unofficial protectorate." ^ Maria T. O'Shea. Trapped Between the Map and Reality: Geography and Perceptions of Kurdistan. Routledge, 2004: p. 100 "Simultaneously, 1000 Christians were killed in Salmas, in a massacre instigated by Simko"
^ a b  "at least 3,000 Egyptians were killed ..."
^ Jonathan Glancey (19 April 2003). "Our last occupation". London: Guardian. Retrieved 1 February 2011. "The rebellion was thwarted, with nearly 9,000 Iraqis killed." ^ The Formation of Modern Syria and Iraq, p. 208, at Google Books "... the British mentioned a proportion of 1 to 3, that is 2,050 killed and 6,150 wounded, while an Arab version speaks of 4,000 killed and 4,800 wounded." ^ "Twentieth Century Atlas – Death Tolls". Users.erols.com. July 2005. Retrieved 1 February 2011. ^ Ayşe Hür, "Osmanlı'dan bugüne Kürtler ve Devlet-4" Archived 25 February 2011 at the Wayback Machine, Taraf, 23 October 2008, Retrieved 16 August 2010. ^ M. Kalman, Belge, tanık ve yaşayanlarıyla Ağrı Direnişi 1926–1930, Pêrî Yayınları, İstanbul, 1997, ISBN 975-8245-01-5, p. 105. ^ "Der Krieg am Ararat" (Telegramm unseres Korrespondenten) Berliner Tageblatt, 3 October 1930, "... die Türken in der Gegend von Zilan 220 Dörfer zerstört und 4500 Frauen und Greise massakriert." ^ a b c Rongxing Guo. Cross border resource management, theory and practice. Ed. S.V.Krupa. Elsevier, 2005: p.115. ^ Ward, Steven R. (2009). "Immortal: A Military History of Iran and Its Armed Forces". Georgetown University Press. Retrieved 7 August 2014. ^ David McDowall, A Modern History of the Kurds, I.B. Tauris, 2002, ISBN 978-1-85043-416-0, p. 209. ^ a b c "200 Years of Conflict: A Very British Century 1910–2010". David Charles.info. 31 December 2010. Retrieved 1 February 2011. ^ a b c d "Twentieth Century Atlas – Death Tolls". Users.erols.com. Retrieved 1 February 2011. ^ a b "Twentieth Century Atlas – Death Tolls". Users.erols.com. Retrieved 7 August 2014. ^ "Archived copy" (PDF). Archived from the original (PDF) on 20 March 2012. Retrieved 15 October 2012. CS1 maint: Archived copy as title (link) "Since 1965, the Libyan-backed Front for the Liberation of Occupied South Yemen and the National Liberation Front had unleashed brutal violence on British forces in the south. In the end, the conﬂict claimed some 200,000 lives." ^ Derek Hopwood. Syria 1945–1986: Politics and Society. Unwin Himan ltd., 1988: p.45. ^ J.E.Peterson, British Counter-Insurgency Campaigns and Iraq. August 2009: p.12. ^ Seale, Patrick (1989). Asad of Syria: The Struggle for the Middle East. University of California Press. p. 93. ISBN 0-520-06667-7. ^ Paul, James A.; et al. (1990). Human Rights in Syria. Middle East Watch Organization. p. 10. ^ John J. Mearsheimer (Aug. 1990 Atlantic Monthly). "1,500 to 5,000 killed"
^ a b c d "Twentieth Century Atlas – Death Tolls". Necrometrics.com. Retrieved 7 August 2014. ^ Gil, Ata. La Turquie à marche forcée, Le Monde diplomatique, February 1981. ^ Devrimci Yol Savunması, Defense of the Revolutionary Path. Ankara, January 1989, pp. 118–119. ^ "Call to try Turkish coup leaders". Al-Jazeera. 13 September 2010. ^ John Pike. "Kurdistan – Kurdish Conflict". Globalsecurity.org. Retrieved 1 February 2011. ^ Kadivar, Cyrus. "A QUESTION OF NUMBERS". Emad Baghi. Retrieved 25 May 2018. ^ JAY PETERZELL (24 September 1990). "The Gulf: Shi'Ites: Poorer Cousins". Time. Retrieved 1 February 2011. ^ Riyadh (10 January 1980). "63 Zealots beheaded for seizing Mosque". Pittsburgh Post-Gazette. Retrieved 12 November 2010. ^ "Call to try Turkish coup leaders". Al Jazeera. Retrieved 9 December 2015. ^ "Twentieth Century Atlas – Death Tolls". Users.erols.com. Retrieved 1 February 2011. ^ "Wars and Conflicts of Yemen (1914–present)". The History Guy. Retrieved 1 February 2011. ^ [ "Syrian car bomb attack kills 17". 27 September 2008. Retrieved 25 May 2018 – via news.bbc.co.uk. ^ K. McLachlan, Iran and the Continuing Crisis in the Persian Gulf. GeoJournal, Vol. 28, Issue 3, Nov. 1992, p. 359; "400 Die as Iranian Marchers Battle Saudi Police in Mecca; Embassies Smashed in Tehran". New York Times. 2 August 1987. ^ Matthew Duss and Peter Juul. The Fractured Shia of Iraq. Center for American Progress, January 2009. p.9. ^ Gamel, Kim (14 April 2009). "AP Impact: Secret Tally Has 87,215 Iraqis Dead". Associated Press (via ABC News). ^ Leigh, David (22 October 2010). "Iraq War Logs Reveal 15,000 Previously Unlisted Civilian Deaths — Leaked Pentagon Files Contain Records of More than 100,000 Fatalities Including 66,000 Civilians". The Guardian. Retrieved 20 November 2010. ^ Rogers, Simon (23 October 2010). "Wikileaks Iraq: Data Journalism Maps Every Death — Data Journalism Allows Us To Really Interrogate the Wikileaks Iraq War Logs Release. Here Is the Statistical Breakdown — and Data for You To Download". Data Blog — Facts Are Sacred (blog on The Guardian). Retrieved 20 November 2010. ^ "Iraq: The War Logs". The Guardian. ^ Carlstrom, Gregg (22 October 2010; last modified 24 October 2010 (at 21 November 2010)). "WikiLeaks Releases Secret Iraq File — Al Jazeera Accesses 400,000 Secret US Military Documents, Which Reveal the Inside Story of the Iraq War". Al Jazeera English. Retrieved 21 November 2010. ^ Staff writer (23 October 2010). "Iraq War Logs: What the Numbers Reveal". Iraq Body Count. Retrieved 20 November 2010. ^ "Kurdish unrest erupts in Syria". BBC News. 6 June 2005. ^ "Bloody 2009". Yemen Post. 10 April 2010. Retrieved 1 February 2011. "The long ongoing war in Sa'ada that has killed over 8000 Yemenis in 2009 alone." ^ Armed Conflicts Report – Yemen. Ploughshares.ca. Archived 30 October 2009 at the Wayback Machine. Retrieved 9 November 2009. ^ "Over 600 Palestinians killed in internal clashes since 2006". Ynetnews.com. 6 June 2007. Retrieved 1 February 2011. ^ "Palestinian Center for Human Rights". Pchrgaza.org. Retrieved 1 February 2011. ^ "Chaos prevails as protesters, police clash in Iranian capital". CNN. 21 June 2009. ^ Noel Joseph Guckian. British Relations with Trans-Jordan, 1920–1930. University College of Wales, Aberystwyth. Ph.D Thesis: pp. 217–218. May 1985. ^ Brogan, Patrick (1989). World Conflicts. London: Bloomsbury. p. 298. ISBN 0-7475-0260-9. ^ "Iraq (Kurds)". Minorities at Risk. University of Maryland. ^ Jordi Tejel. Syria's Kurds: history, politics and society. 2009. p.156. ^ "Habbaniya War Cemetery". Commonwealth War Graves Commission. Retrieved 12 August 2010. ^ Nat. Arch. 891.00/1-1547, 15 January 1947. Touraj Atabaki, Azerbaijan: Ethnicity and the Struggle for Power in Iran. [Revised Edition of Azerbaijan, Ethnicity and Autonomy in the Twentieth-Century Iran] London: I.B.Tauris, 2000. pg 227. "A British source cited by the US Embassy in Tehran gives the number of killed Democrats as 421. The American Embass's report has been classified under wash."
^ Tadeusz Swietochowski, Russia and Azerbaijan: A Borderland in Transition. New York: Columbia. University Press, 1995. p. 154. "Rossow conservatively estimated 500 killed during the lawless interregnum that preceded the coming of the Iranian troops. Hundreds of others were tried and jailed, and scores were hanged." ^ "The Yom Kippur War". thenagain.info. ^ "The History Guy". Retrieved 26 July 2010. ^ "Document – Iran: Violations of human rights 1987–1990 | Amnesty International". Amnesty.org. Retrieved 7 August 2014. ^ NA 59/8/353/84/867n, 404 Wailing Wall/279 and 280, Archdale Diary and Palestinian Police records. ^ "29 Oct 1933 – Riots in Palestine SEQUEL TO FORBIDDEN PROCESSIO". Trove.nla.gov.au. 29 October 1933. Retrieved 7 August 2014. This page is based on the Wikipedia article List of modern conflicts in the Middle East; it is used under the Creative Commons Attribution-ShareAlike 3.0 Unported License (CC-BY-SA). You may redistribute it, verbatim or modified, providing that you comply with the terms of the CC-BY-SA.